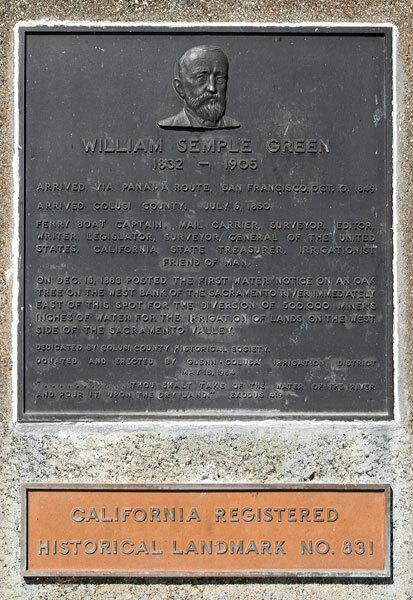 Ferry boat captain, mail carrier, surveyor, editor, writer, legislator, Surveyor General of the United States, California State Treasurer, irrigationist, friend of man. 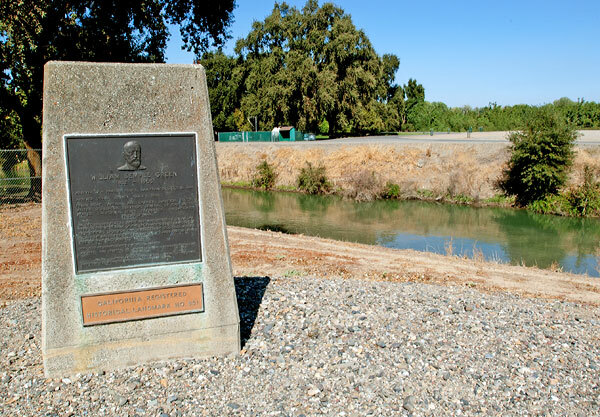 On Dec. 18, 1883 posted the first water notice on an oak tree on the west bank of the Sacramento River immediately east of this spot for the diversion of 500,000 miner's inches of water for the irrigation of lands on the west side of the Sacramento Valley. Note 1: Colusi County, named after a local Indian tribe, was created in 1850 by the California state legislative act. In 1854, when the county seat moved from Monroeville to the town of Colusa, the name of the county was changed from Colusi County to Colusa County. Next, in 1856, portions of Colusa, Shasta and Butte Counties were combined to create Tehama County. For a short while, the town of Tehama was the seat of the new county before the honor was transferred to Red Bluff. Finally, in 1891, the northern half of old Colusa County became Glenn County with Willows as its county seat.